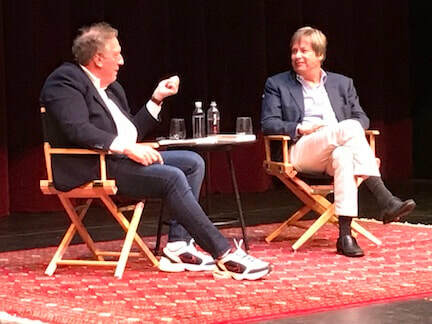 Last Tuesday I was delighted to attend the Dave Barry and Alan Zweibel talk hosted by Live Talks Los Angeles at the Ann and Jerry Moss Theatre in Santa Monica. Barry is a widely popular, best-selling author and columnist who is now touring with a new book: “Lessons from Lucy: The Simple Joys of an Old, Happy Dog.” Barry, author of Dave Barry Turns 40 and many other books and columns, was awarded the Pulitzer Prize for Commentary and the Walter Cronkite Award for Excellence in Journalism. Alan Zweibel is an award-winning author and producer, and one of the original writers on Saturday Night Live. He also co-created and produced It’s Garry Shandling’s Show, and others. He is the author of several books, including Bunny Bunny: A Sort Of Love Story about Gilda Radner; and for Saturday Night Live he wrote some of the iconic early sketches, such as John Belushi’s samurai delicatessen sketch, that are now classics. Both were relaxed and naturally, easily amusing on-stage and, after their long friendship, displayed good-natured ribbing back and forth. Ted Habte-Gabr, the founder and producer of Live Talks LA — also a long-time friend of theirs, introduced the pair. Ted met Dave many years ago when running the speakers series at the University of Iowa as a student. Dave was an early guest. At that time, Dave was running for president, something he does habitually. His slogan “It’s Time We Demanded Less” has new meaning these days! Alan and Dave met in Washington, D.C. at an after party when Steve Martin was given the Mark Twain Award. 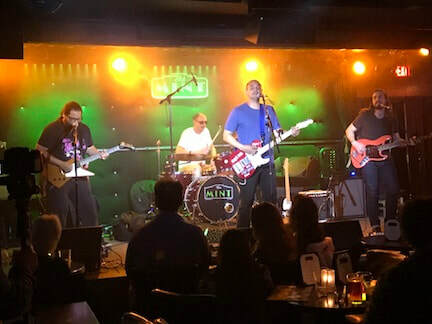 They are both in the band Rock Bottom Remainders, a band that is proudly terrible and composed mostly of fellow writers. Soon after meeting, the two collaborated on the book Lunatics, and other works, each while also separately developing their comic writing and books through the years. Dave was raised Christian, and is not particularly religious now, but his wife and children are Jewish. Dave had a most amusing story about his grandson’s bris that left the audience in stitches. He also talked at length about his new book, Lessons from Lucy, saying what prompted him to write the book was that he turned 70 last year and his dog Lucy was 10, which is 70 in dog years. Lessons from his beloved pooch include letting go of anger, living in the moment, being kind to your loved ones, etc. Dave also discussed the last chapter of his book, which unlike the rest of his comic writing, turns quite poignant. He writes movingly of his daughter’s severe health struggles and paralysis shortly before entering college. Happily she has now recovered and is a student at Duke University. Alan spoke proudly and humorously of his Jewish background; he was raised in the faith and continues to practice it as an adult. He started in comedy writing jokes for the Catskills comedians at $7 a joke. An early one is about the sperm bank. It’s the only bank where you actually lose interest after making a deposit! Alan pursued comedy after not making it into law school, and met Billy Crystal early on and then Lorne Michaels, which led him to Saturday Night Live. An early joke he showed Michaels was about the post office making a commemorative stamp for prostitutes: It’s 10 cents a stamp, but if you want to lick it it’s 25 cents! All in all, a lighthearted and very entertaining evening with two of the funniest friends on the planet. and get out of your own way! ​I recently saw a press preview screening of the film Viceroy’s House, an excellent retelling of the story of India’s independence from Britain in 1947. This dramatic film shows the incredible hardship the two new countries endured as a result of the partitioning of India into two nations: India and Pakistan. It’s also a moving love story, with many dramatic scenes and impressive attention to detail. The film opens on Sept. 1, and was directed by Gurinder Chadha, whose own family went through this story. 14 million refugees were created by the forming of the two counties, with repercussions that last even today. A fascinating tale of a remarkable moment in recent history, memorably told.